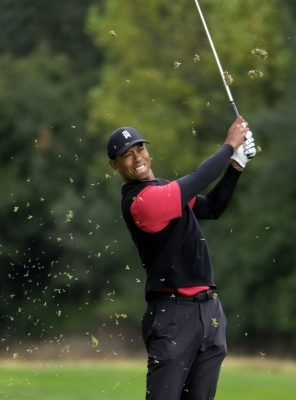 London, April 15 (IANS): Ace golfer Tiger Woods, who won the Masters for the fifth time at the first major of the season played at the Augusta National course, believes he was "just lucky to do this again". In a historic feat, Woods won his second major at Augusta on Sunday after a gap of 14 years. The 43-year-old brought a huge smile to the faces of his fans when he sank his last putt on the 18th green on a day marked by wind and light rain. Finishing a whopping 13 under par, Woods defeated his countrymen Dustin Johnson (-12), Xander Schauffele (-12) and Brooks Koepka (-12) to win his 15th tourney. "With all the things that I've battled through, I'm just lucky to be able to do this again," The Guardian quoted him as saying. The golf icon, who had undergone several back operations and endured a series of personal vicissitudes over the past 11 years, also said that this win ranked among the top of his 15 majors. "It's got to be right up there." He admitted that he was very disappointed when his kids watched him lose the Open to Francesco Molinari last year and therefore he was determined not to let that happen again. "I wasn't going to let that happen again," Woods said, "For them to see what it's like to have their dad win a major championship, I hope that's something they will never forget."